Want to play Flash videos on iPhone? Need to know how to play flash video on iPhone? As known to all, Apple devices don’t support Flash and there is no Adobe Flash player for iPad and iPhone. Flash video occupies a large amount of storage and eats battery life a lot. So, you may doubt that there is any way to play flash video on iPhone. Actually, we can still play flash videos on iPhone. We could make use of specific browser to play flash video on iPhone, download iPhone flash player apps, or convert Flash video to iPhone compatible videos. This guide would show you several top-rated iPhone flash players, how to convert flash video to iPhone and transfer Flash video to iPhone. To play Flash videos on iPhone, the best solution might to make use of Flash player for iPhone, which could act exactly like a video player that could play almost all video files on iPhone. By searching on the App Store on iPhone, you could get multiple flash players on iPhone. The below 3 iPhone flash player apps would be your top choices. VLC is a simple, fast and powerful Adobe Flash player for iPhone/iPad. It is the most popular video player among many people. You can run it on all iOS or Android devices, and even Windows, Linux, and Mac OS X. It supports various codecs like DivX or H.264, and different video formats like FLV, avi, mkv, mp4, wmv, and more. 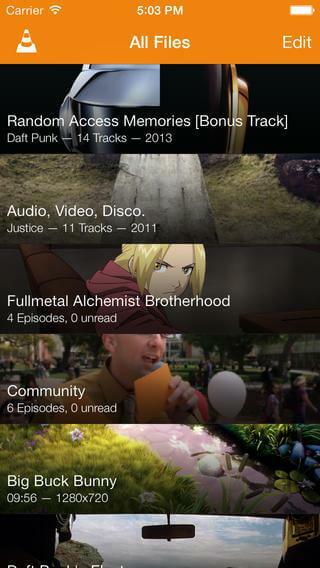 Air Playit HD is a rarely free but featured video player app for iPhone 5s/5, etc. and serves as an awesome video streaming tool at the same time. In addition to regular audio/video content, it also supports purchased movies from iTunes store (DRM protected). The offline conversion feature makes it possible to play videos in MKV, AVI, WMV, etc. formats on iPhone/iPad/iTouch without previous conversion required. Other features include auto music stream catching, Wi-Fi (HTTP) file transfer, Apple TV-Out support and the like. Another solution for you to play flash video on iPhone is to make use of Flash video converter to convert Flash video to iPhone videos. Therefore you don’t need to install Flash player on iPhone. You only need to install Flash video converter on your computer and then transfer flash video to iPhone for playback. 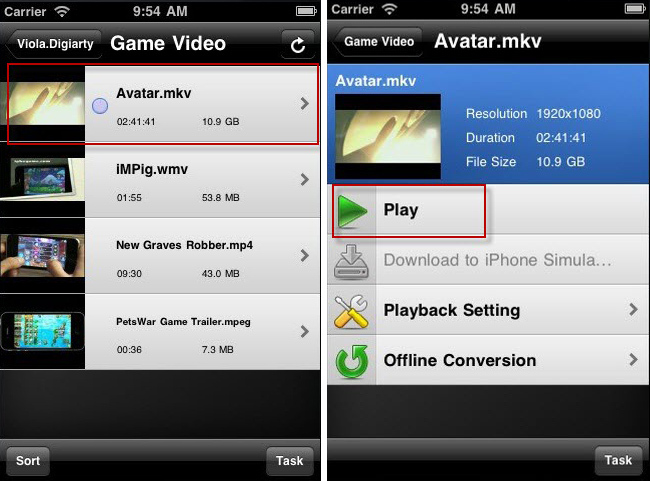 Leawo Video Converter can help you easily convert Flash video to MP4 or MOV videos that are recognized by iPhone. Therefore you could play Flash video on iPhone with the pre-installed Videos app on your iPhone as Flash player for iPhone. Download and install Leawo Video Converter on your computer. The below steps show you how to convert Flash video to iPhone compatible audio files with Leawo Video Converter. Launch the software, then click "Video Converter" on the screen or "Convert" at the top to enter "Convert" interface. Choose "Add video" at top left to browse and import Flash video from the local drive of your computer. Click drop-down box right before the green button "Convert" at top right and choose "Change" to enter to "Profile" panel. 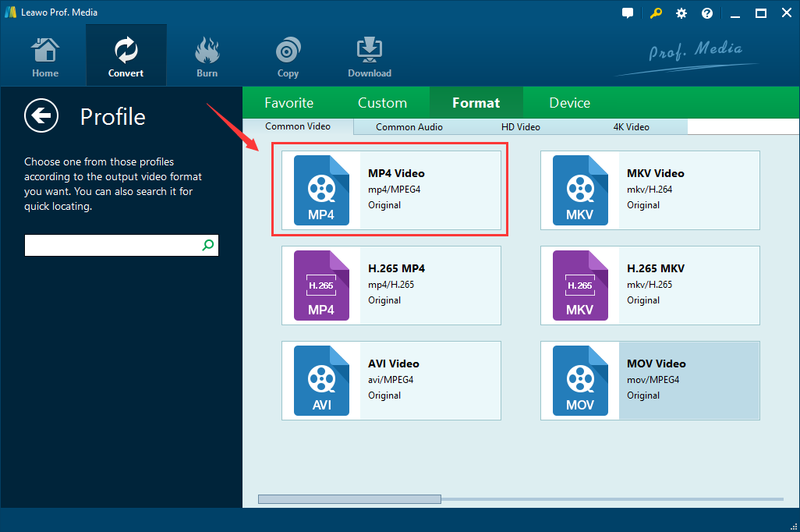 Click "Format > Common Video > MP4" successively to choose MP4 as output format. Back to the drop-down box and click "Edit" to go to "Profile Settings" panel. 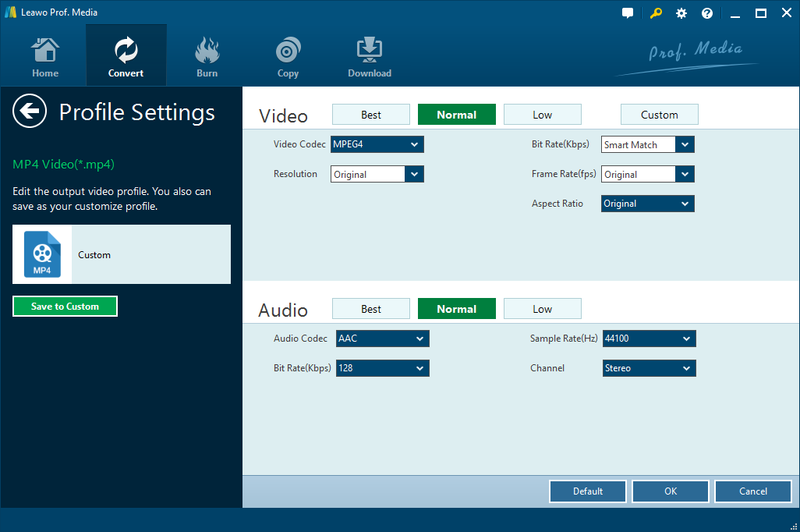 There you could adjust the video and audio parameters of output MP4 file, including video codec, bit rate, aspect ratio, frame rate, quality, resolution, audio codec, audio bit rate, audio sample rate, channel, etc. Click "OK" to go back the main interface and choose the green button "Convert" button. On the popup sidebar, set output directory in the "Save to" box. After that, the converting process begins. Remember not to stop converting. If you’re using a Mac computer, you could turn to Leawo Video Converter for Mac to convert Flash video to iPhone videos on Mac. The operation of Mac Video Converter is quite similar to that of Windows. After converting Flash video to iPhone videos, the next question is how to get Flash video on iPhone. You could get Flash video on iPhone through iTunes’ sync feature, though iTunes would erase all existing movies and videos on iPhone. A better alternative to iTunes is recommended. That is Leawo iTransfer, a professional iOS data transfer software app that could transfer and manage data and files between iTunes, iPhone, iPad and PCs. It is quite like iTunes, but won’t erase the existing video and movie files on your iPhone when transfering Flash video to iPhone. Download and install this iTransfer on your computer. The below steps would show you how to transfer Flash video to iPhone with Leawo iTransfer. Head to "iPhone > Library > Movies" tab. 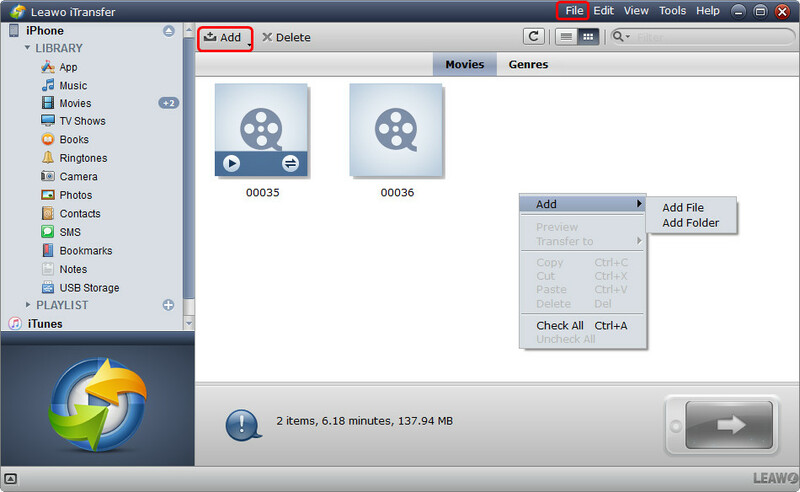 On the right panel, click the "Add" button and then choose either "Add File" or "Add Folder" to browse and add Flash video you’ve converted to iPhone compatible videos to this iTransfer software. Upon transfer, this iPhone video transfer app would start to transfer Flash video to iPhone immediately. You then only need to wait the the transferring complete. 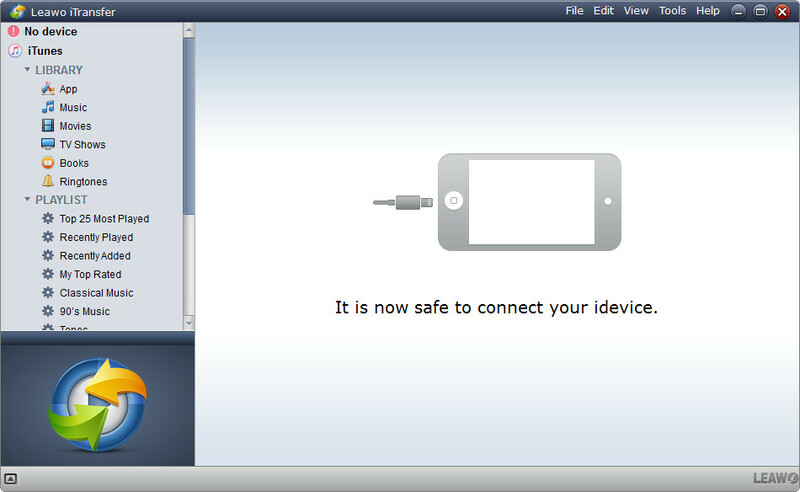 If you’re using a Mac computer, you could make use of Leawo iTransfer for Mac to get Flash video to iPhone on Mac.